Years ago, what used to be the United States of America became the country of Panem. A technically-advanced dystopian society in which the outlining Districts of its Capitol must supply it with resources. 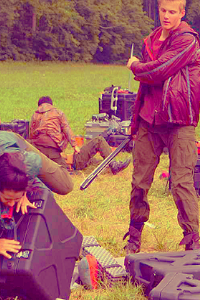 After an uprising against the Capitol by District 13, it was destroyed. The remaining 12 Districts were faced with the Treaty of Treason. "From this moment forward, each year, the various Districts of Panem, because of defiance against their Capitol, will offer up Tribute: one young man and woman. Who are chosen from a lottery at a public "Reaping." Who will then be immediately put into the custody of the Capitol. After which, these Tributes will enter an unknown Arena where they will fight to the death until one lone Tribute remains. This Tribute then crowned Victor, will serve as a living testament of our gratitute, and our generosity. This event will be known as the Hunger Games. This is how we protect our country. This is how we safeguard our future." 74 years later. District 12's Tributes Katniss Everdeen and Peeta Mellark somehow make it out of the treacherous Arena together after appealing to the mercy of the Head Gamemaker of their Games by using a suicide attempt trick, Seneca Crane. After the 74th Hunger Games, Seneca Crane suddenly disappeared, and now a new Gamemaker has risen to head. The 75th Annual Quarter Quell Hunger Games have begun. WILL THE CAPITOL SUCCEED IN BRINING PANEM BACK TO ORDER? OR WILL THEY JUST GO UP IN BLOOD AND FIRE?